The foundation proudly names Danish-born journalist Sven Rye as its Scandinavian of Year 2002. 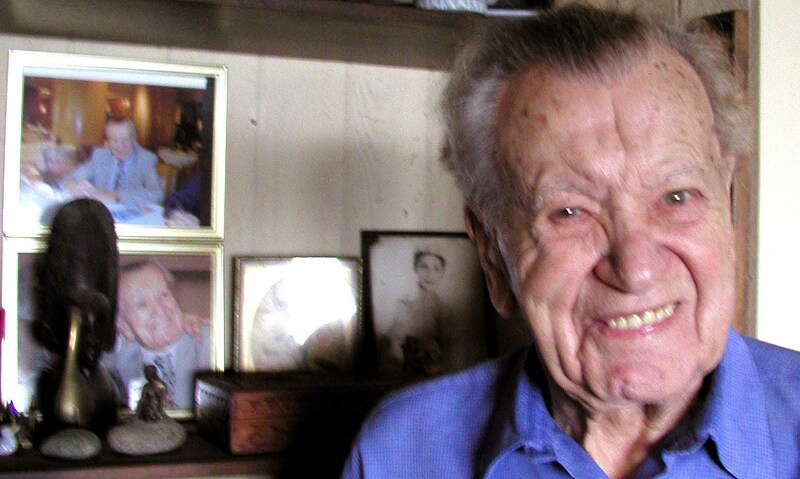 The first question in one's mind, upon meeting the 96-year old, is: "How does a man his age manage to stay so young?" Two ways: by surviving cancer at age 80, and by continuing to run around like a 20-year old. A third is by seeing the good in everyone he meets. "Don't people grow dark with age, don't they have an 'old perspective' on life?" one wonders. According to Sven, one doesn't. He lives life fully, finding it a sea of pleasure he wants to dive into. The next questions are: "How does he manage to continue working in a field that's so stressful?" And, "How can he write for teen magazines, continuing to entertain such young readers with the latest Hollywood news?" Somehow he does it. He's young at heart. He's really not an old man, but a young one eager to meet new people, to know them, to write about them, and to enjoy their company. He loves people, and one instantly feels it the moment one meets him. He's warm, welcoming and likable. At his home in Laguna Beach, Calif., Sven explains that he's been this way since his boyhood in Randers, Denmark. The second of seven children, he was born with a positive outlook -- and that's the way it's been ever since. "That's the way you stay young," he says. "By being happy." Hard times never got him down. Sven lived through two world wars; the second was personal. Working underground against the Nazis, and writing critically about their occupation of Denmark, he was forced to escape to Sweden, where he found a job with the British newspaper The Daily Express, as a Stockholm correspondent. In addition to his positive outlook, there's something else no one has ever taken from Sven. He's written the entire time. "Nothing has been able to stop me," he says, in his small living room, where piles of clippings and magazines make it hard to get around. He practically was born in front of a typewriter, in fact, as his father worked at the local newspaper founded by Sven's grandfather. Randers soon was too small for the young journalist, who later would advance to become a European Hollywood reporter, and long-standing member of the Hollywood Foreign Press Association. Sven first moved to Odense to pursue his goal, and later to Copenhagen, primarily writing as a cultural reporter. His field was theatre, which he loved. But these cities also were too small. Sven longed for America. He left Denmark in 1947 with $50 in his pocket. He came to the U.S., and soon found his way from the East coast to Los Angeles, which he discovered was the center of the world -- the center of the Hollywood world, at least. He began interviewing stars and, as one of the first European reporters in town, worked for seven different countries, including Norway, Sweden and Finland, as well as approximately 30 publications. In 1963 he became president of the Hollywood Foreign Press Association, and still is an active member. He's written for almost every Danish magazine and newspaper, and most likely entertained grandparents, parents and children alike with sensational Tinseltown stories. Sven still meets everyone famous. He got close to people like James Stewart, Joan Crawford, Marilyn Monroe, Betty Davis, Elvis Presley and Jack Lemmon. And though he speaks warmly about them, it doesn't matter to Sven whether they're Marilyn Monroe or Gitte Jensen. He treats them all with respect. As a journalist, his philosophy is never to write badly about anyone. The reason? Sven answers, "Everyone has good in them."